I feel like I have a dirty secret. The secret is this quilt I've been working on for ME! I have made quite a few quilts now, but never a quilt for myself. This quilt has been affectionately dubbed "Rainbow Barf" around our home - mostly for the obnoxious use of color and the arcs shapes. When I decided I wanted to make a quilt for myself, I planned and schemed and researched and finally decided to do a pickle dish/double wedding ring quilt. I can't tell the difference between those two patterns. 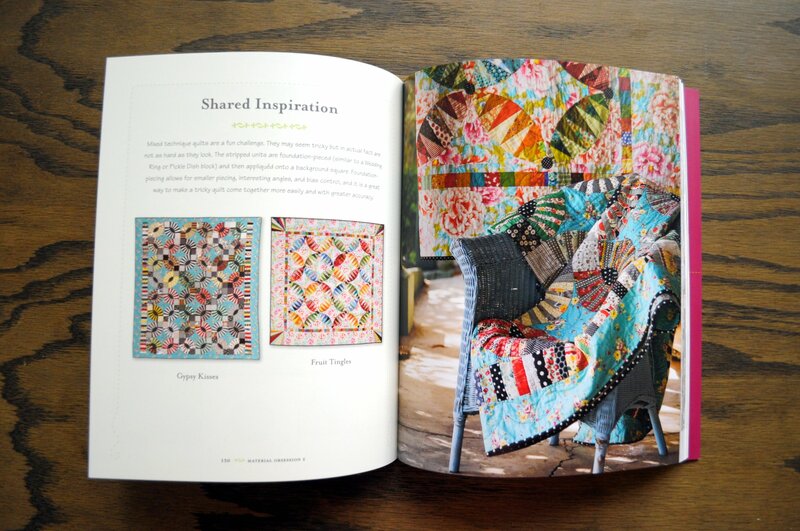 I was inspired by the awesome quilt in the book Material Obsession 2. Can you see it, on the left and draped on the chair? I'm far too cheap to purchase a pattern, so I drafted up the pattern on the computer and set to work cutting and piecing. It hasn't taken too long, I've been working on the quilt for about 1 month at various intervals between LOTS of other sewing. These are some of my favorite combos. I have no idea why! They can be a bit in-your-face color-wise. The quilt has a scrap of *almost* every fabric I own! It's been very fun to match the arc fabrics based on value (light/dark) instead of by color. To match them I used my camera in black and white mode and took photos of the fabrics. This ensures that there is a good amount of contrast in the arcs. Sometimes if you just squint really hard at the fabrics - you can get a good test of value. If the colors both mesh together (like the light purple and green in the photo below), then there isn't much value difference. If one color stands out (like the woodgrain and pink tiles below) there is a high contrast/difference in value. I'm using polyester batting *gasp* because I don't like heavy quilts. This baby is BIG! It's about 82" x 82". I've just started the hand quilting and it's been very relaxing! The backing is a large 1" check gingham in a mint color - you can see it at the bottom left and right on the photo below. This last photo shows how I've been quilting it. I'm skipping every other "ray" and quilting with perle cotton in size 10. I feel much better now that I've shared my "secret" (and selfish?) quilt. Becky, I love it! I'm working on ones for the boys and us simultaneously...we'll see which get finished first!